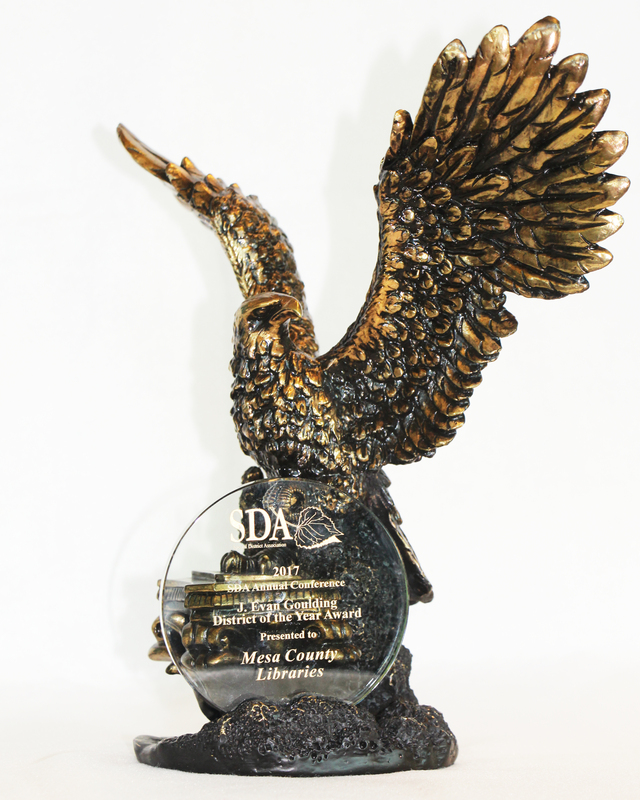 Mesa County Libraries received this trophy for being named the 2017 District of the Year by the Special District Association of Colorado. The Mesa County Public Library District has been selected as the 2017 District of the Year by the Special District Association of Colorado. This year marks the first time that a library district has won the honor. The Mesa County Public Library District operates eight library locations throughout Mesa County, circulating 1.4 million items and receiving approximately 770,000 patron visits annually. “The J. Evan Goulding District of the Year Award was established by the SDA Board of Directors to single out a district that demonstrates exceptional leadership and community spirit. The award recognizes a district’s major accomplishments, series of outstanding efforts, and a steady determination to serve its constituency. This year’s winner, Mesa County Public Library District, truly exemplifies these qualities,” the Special District Association (SDA) said in presenting the award. The SDA cited the library district’s track record of expanding and maintaining library services throughout the county, both in the form of branch locations and through the Words on Wheels service for elderly and disabled residents who are physically unable to visit the library. The SDA also lauded Mesa County Libraries for the development of “cutting-edge opportunities for their patrons,” such as the 970West Studio, a public multimedia studio that serves as a digital makerspace for the community; the 970West Studio Artist in Residence program; and the creation of the 970West Digital Collection that includes digitized fine art, a collection of resources preserving the unique aspects of Mesa County’s culture, and the Veterans Remember collection of interviews with local veterans. Other unique aspects of Mesa County Libraries that the SDA cited in its award presentation are the library’s creation of Wild Colorado, a Colorado-specific wildlife identification app that includes a sizeable database of mammals, birds, fish, and reptiles found in the state; Career Online High School, an online high-school diploma and career certification program offered in cooperation with the Colorado State Library; and Factory, a co-working space in downtown Grand Junction in which Mesa County Libraries are a collaborator. Library Director Joseph Sanchez and other library officials accepted the award Sept. 15 at the SDA’s annual conference in Keystone. The Special District Association of Colorado is a statewide membership organization created in 1975 to serve the interests of the special district form of local government in Colorado. Special districts fill a vital role in providing many basic services and public needs of the people of Colorado, including fire and rescue services, water and wastewater treatment and delivery, parks and recreation amenities, hospitals, libraries, and cemeteries. SDA has more than 1,700 special district members and 260 associate members. RECEPTIONS PLANNED SEPT. 21: JOIN THE LIBRARY IN CELEBRATION! To celebrate the award, the Mesa County Libraries Foundation plans a series of simultaneous public receptions at several library locations Sept. 21. Library patrons are invited to enjoy cookies, courtesy of the Foundation, from 11 a.m. to 1 p.m. Thursday, Sept. 21, at the Central Library in downtown Grand Junction and at library branches in Clifton, Fruita, Orchard Mesa, and Palisade. Stop by and celebrate with us! Posted in 970West, Branches, Factory, General, Kids, Library News, Literacy, Programs/Classes, Teens, Virtual Branch.